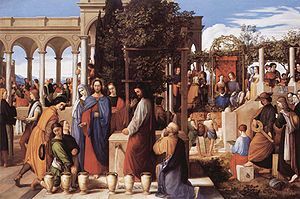 John’s Wedding at Cana — Chronicle or Parable? We all know the standard line: the synoptic evangelists tell us that Jesus’ ministry heavily relied on parables, while the Fourth Gospel contains none. It’s a striking conundrum. However, for a long time now I’ve been considering the possibility that John is itself entirely a parable gospel. That is to say, each pericope may stand primarily as an allegorical story, regardless of whether it is based on historical events. The story of Jesus changing the water into wine, for example, seems to contain so many obvious references — narrative points and objects that have direct theological allusions — that resemble the parables in the other gospels. It is one thing to see the symbolism in the pericopae of John’s gospel; it’s another to see them as parables. Crossan concludes this chapter by explaining that John, at least in part, is a sustained polemic against the synoptic vision of Christianity. I think Crossan is right. Again and again, John takes a cue from the synoptics (usually Mark or Luke), turns it on its head, and re-forms it into a new vision — a parable with Jesus as the central actor. This process is described to good effect in Thomas L. Brodie’s The Quest for the Origin of John’s Gospel: A Source-Oriented Approach. Brodie points out that the first miracle(s) (i.e., the exorcism at the end of Mark 1 and the water-into-wine miracle in John’s second chapter) have “curious links.” (See p. 70ff.) Certainly the oddest has to be the stern “What is there to me and to you?” said by the demon to Jesus in Mark and by Jesus to his unnamed mother in John. In the end Dodd concedes the process by which a parable might have become historicized is all conjecture. However, it makes me think we’re on the right track. In future posts I would like to explore these themes — how John used the synoptics and why, and whether Fourth Gospel is indeed a “megaparable” or at least a collection of parables starring Jesus. Posted on 2012-11-13 17:33:24 GMT+0000 by Tim Widowfield. This entry was posted in Biblical Studies, Scholars and tagged Crossan: Power of Parable, Gospel of John, John Dominic Crossan, Rudolf Bultmann, Thomas Brodie. Bookmark the permalink.